Habit: Burl 0. Stem: twig glabrous to sparsely short-nonglandular-hairy. Leaf: dull green. Inflorescence: 4--7-branched; inflorescence axis 1 mm wide. Flower: ovary (and fruit) minutely glandular-hairy. Fruit: stones generally fused. 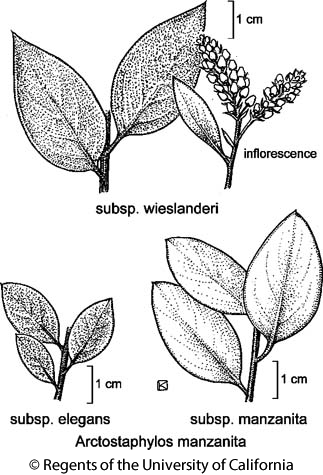 Citation for this treatment: V. Thomas Parker, Michael C. Vasey & Jon E. Keeley 2012, Arctostaphylos manzanita subsp. elegans, in Jepson Flora Project (eds.) Jepson eFlora, http://ucjeps.berkeley.edu/eflora/eflora_display.php?tid=76564, accessed on April 23, 2019.